Comet ISON performs its dive toward the Sun, caught in the morning twilight. This was the infamous and much-hyped Comet ISON (C/2012 S1) as it appeared this morning, November 21, 2013, a week before it performs its hairpin turn around the Sun. The comet was easy to see in binoculars, though the camera picks up a bit more of its faint tail. ISON was much more photogenic a week ago when it was higher in a darker and moonless sky. But this morning I had to contend with bright moonlight from a waning Moon and the brightening dawn. The inset shows a blow up of just the comet. ISON is dropping rapidly toward the Sun, making this perhaps the last sighting I’ll have of it until it reappears – we hope! – from behind the Sun in early December. If it survives its perihelion passage it might blossom into brilliance … or fade into obscurity. No one knows. In the photo above, you can see Mercury at left, shining much brighter than ISON. It was brilliant as it rose into the southeast sky, with the elusive planet now about as well-placed as it gets as a “morning star” for us living at northern latitudes. 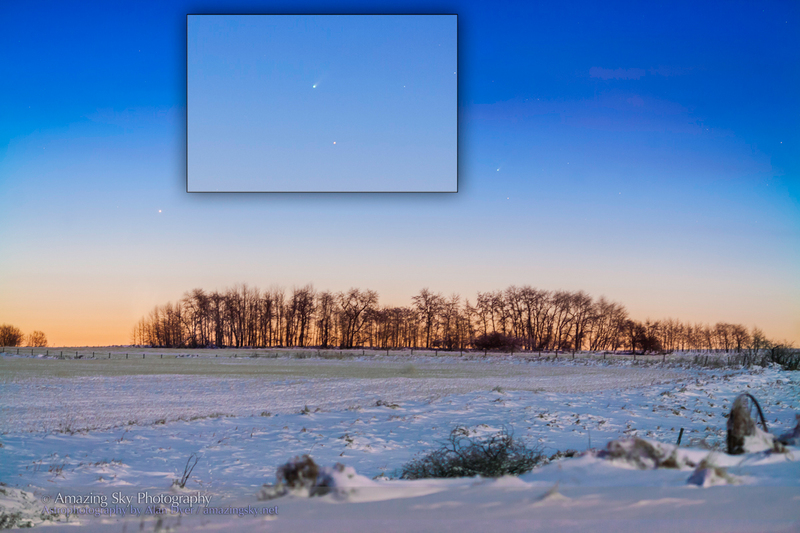 This morning I was able to shoot not one but two comets. 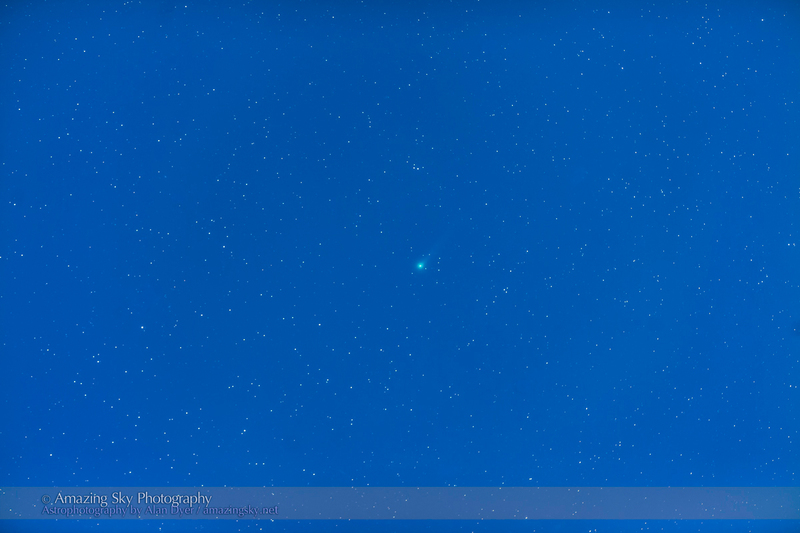 About half an hour before ISON hove into view I aimed the camera up almost overhead toward Ursa Major, to capture Comet Lovejoy (C/2013 R1) as a bright cyan fuzzball with a short tail. Again, the photo brings out the tail – to the eye the comet was obvious in binoculars but appeared as just a fuzzy star. I took both shots with the same gear: a 135mm telephoto lens on the Canon 5D MkII on an iOptron SkyTracker. 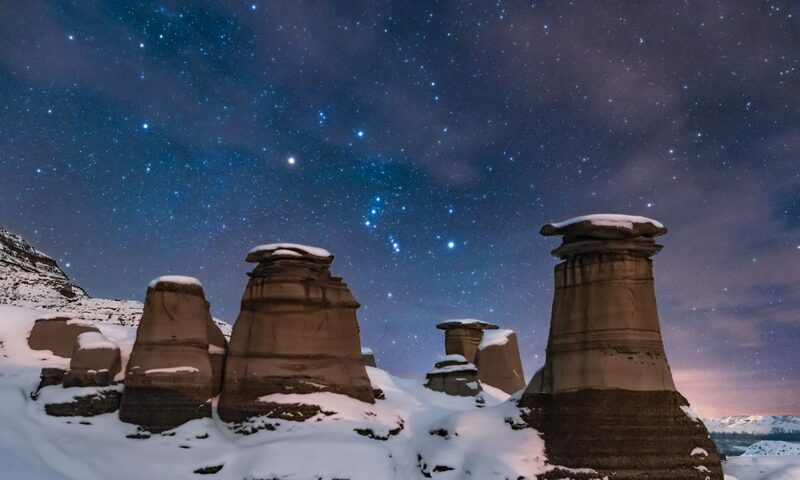 The Lovejoy shot is a stack of 5 x 75 second exposures. The ISON shot is a 4-second exposure, with the colours and contrast boosted for prettiness. This is certainly proving to be a year of comets. It would be nice if just one of them got really bright! Nice photos Alan, I was out an hour before sunrise on Nov 27th, and was able to capture a small image of comet ISON about 10 minutes before the sunrise in the southeast. I took the photo from Irricana area using a 300 mm lens. The comet looked like a fuzzy hair in the red sky. I was hoping I would have more opportunities to photograph the comet in the coming weeks – doesn’t look like it now. I posted the picture on my news page of my web site. I just dropped by after hunting for more information and pictures of comet ISON and happened upon your blog. Thanks for this. We have a graphic on our homepage that links to a page where we are offering updates on the comet. Would it be OK to add a line to our update page and link them to this article?